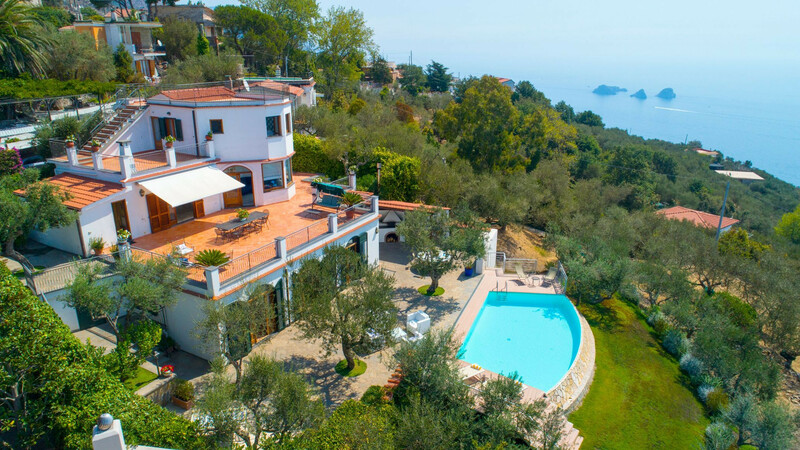 Villa Chez Piè is a substantial and impressive villa, with ample space for twelve people. 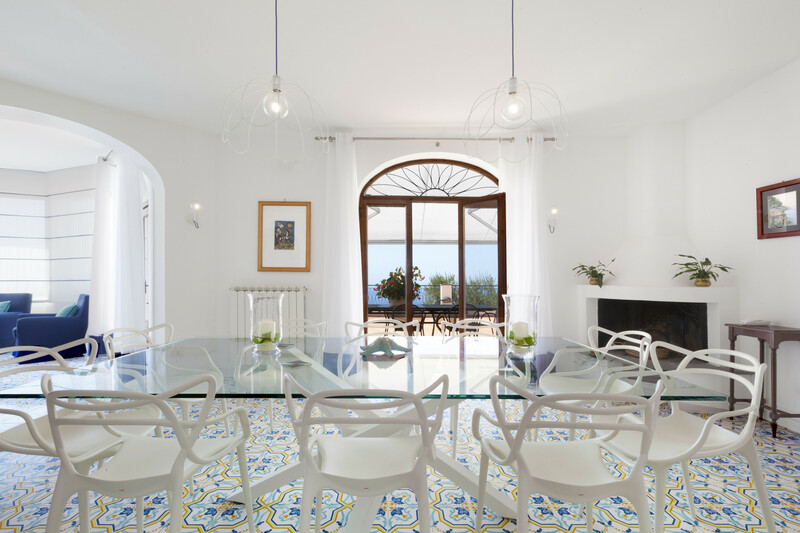 Set on a hillside, surrounded by olive groves, the white terraces of Villa Chez Piè rise upwards to the blue skies, as if flowing with the contours of the landscape. 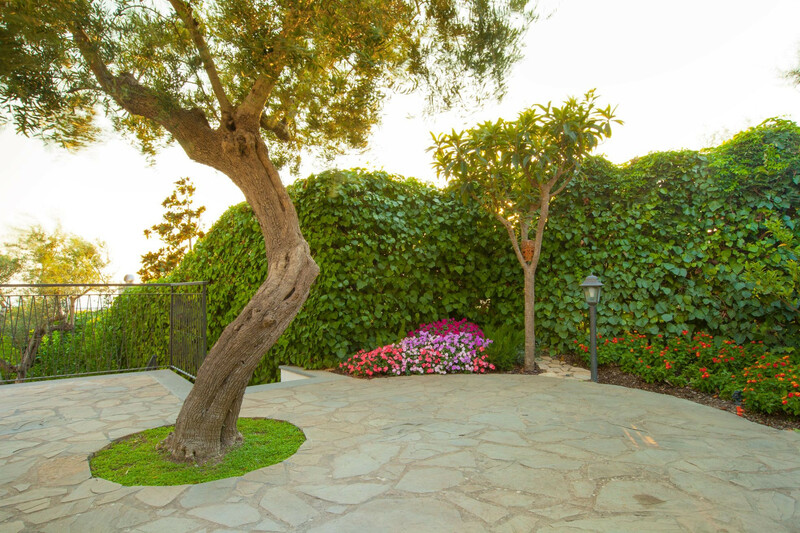 From this lofty position, you can take full advantage of the magnificent panoramic views. 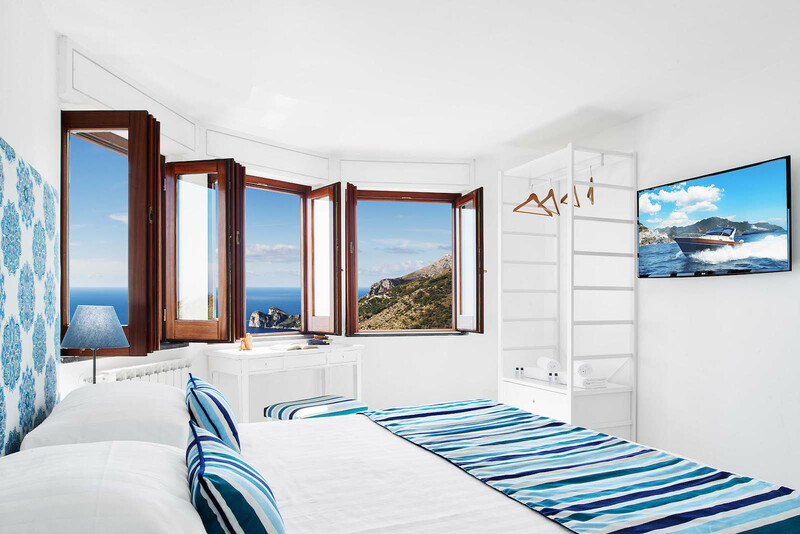 The seas of the Bay of Nerano stretch before you, framed by the sheer beauty of the Amalfi Coast. 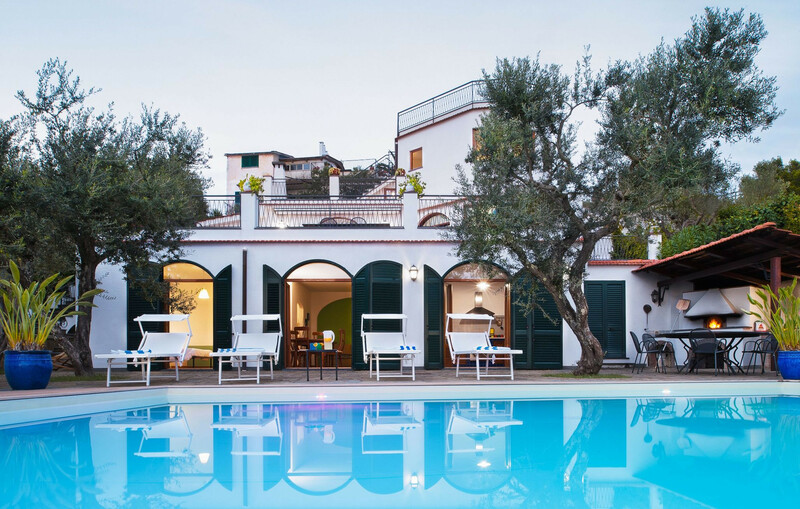 The villa is just 150m from the lovely hamlet of Torca, where you will find a restaurant and a number of authentic food shops selling local produce. On arrival, you can park directly beside the house. If you have a number of vehicles, there is additional parking just 100m away in an enclosed area. 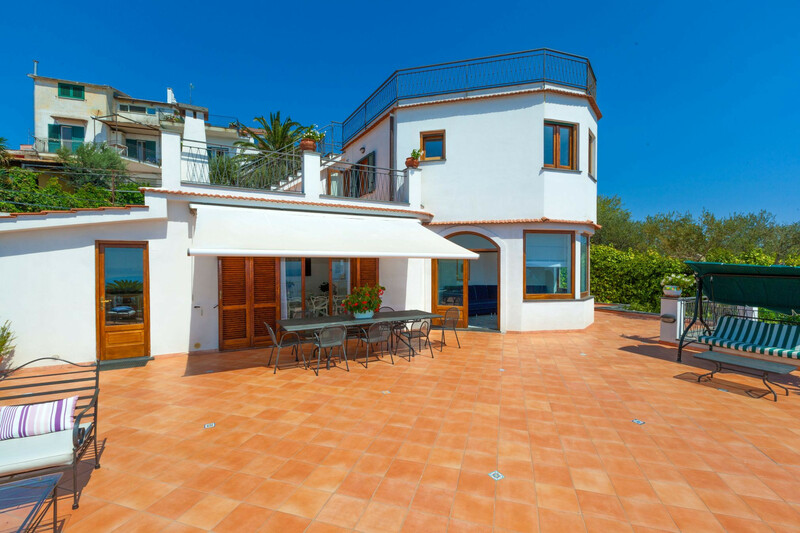 Walking through a small paved courtyard, you arrive on the impressive main terrace, measuring 100m2. This is without a doubt the most enchanting part of Villa Chez Piè. As you stand, gazing towards the azure seas, you will feel any stress and tension just melting away. You can see the Li Galli Islands and on a clear day, even the Cilento Peninsula. The south facing terrace enjoys sunshine throughout the day. It’s easy to find a comfortable place in which to relax, with a dining table and chairs, comfortable bench and armchairs, plus a swing seat for two. There is a retractable awning, so you can enjoy a little shade any time you wish. 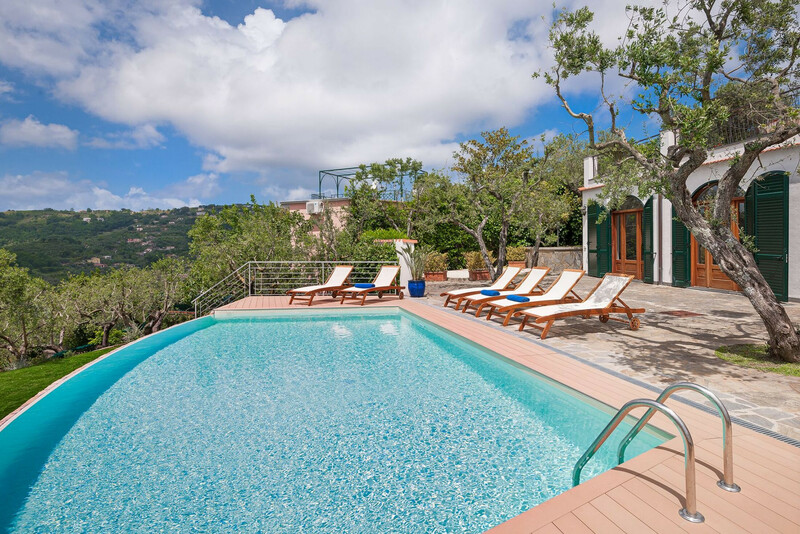 In addition to this lovely terrace, there are three further outdoor levels at Villa Chez Piè. 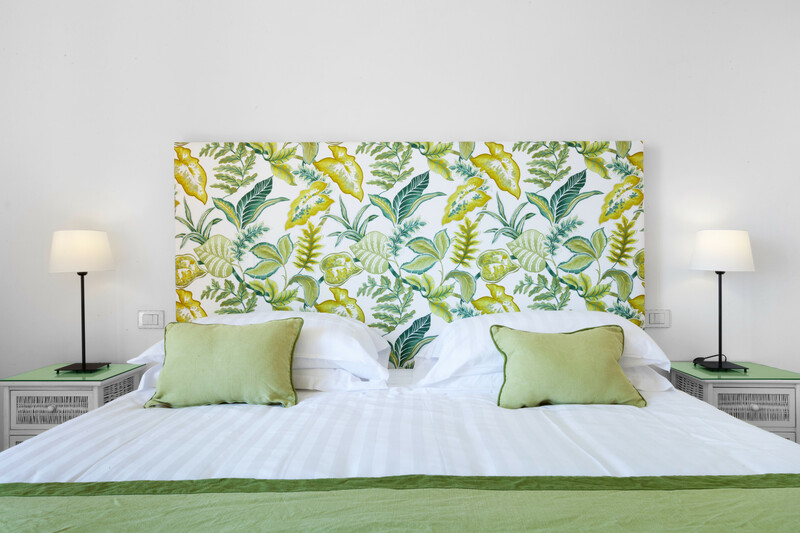 You will be spoilt for choice when deciding where to unwind! A stone staircase leads to the lowest, ground level, where you will find the swimming pool and barbeque area. The above ground pool measures 3.3m by 6.3m and is 1.2m deep. It is open from 4 April to 30 October and is surrounded by sun beds on which to chill out after a refreshing dip. There is also a wonderful outdoor kitchen area, where you will find a wooden burning oven, perfect for rustling up an authentic pizza. The owner, Pièro, would be happy to arrange for a chef to cater for your party. Don’t miss the chance to enjoy a pizza dinner or a barbeque, created, when available, with fresh seasonal fruit and vegetables from the garden in front of the house. 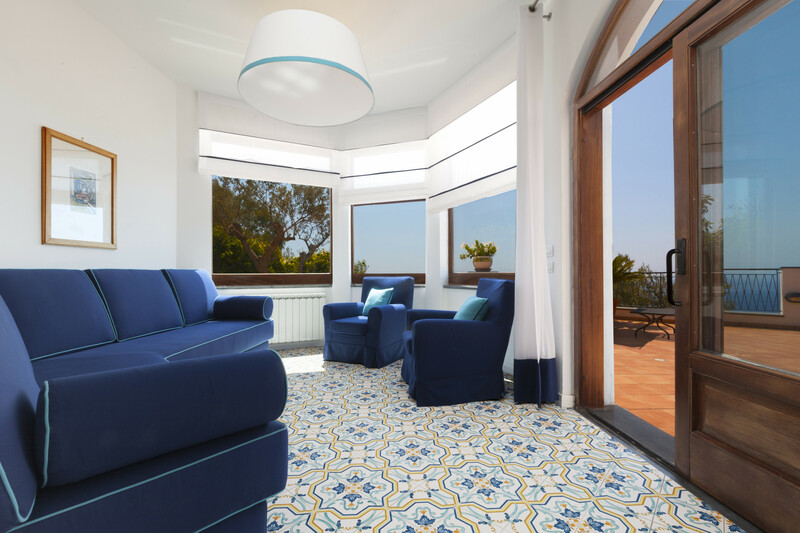 There is a further large terrace on a higher level, also boasting amazing sea views - the perfect place for sun bathing on a deck chair. Finally, an outside staircase takes you to the roof terrace of the villa, offering a fabulous 360 degree view of the sea and coastline. Make sure your camera batteries are charged! 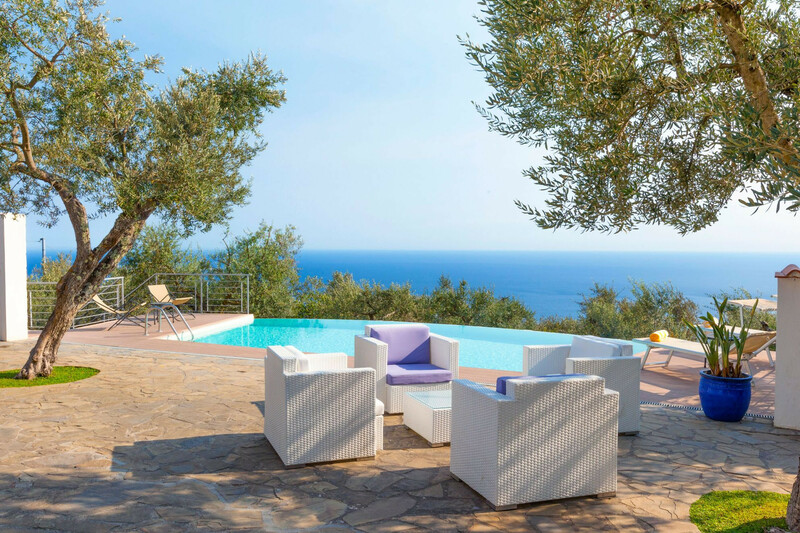 The villa itself measures 200m2, offering more than enough space in which to spread out and relax. 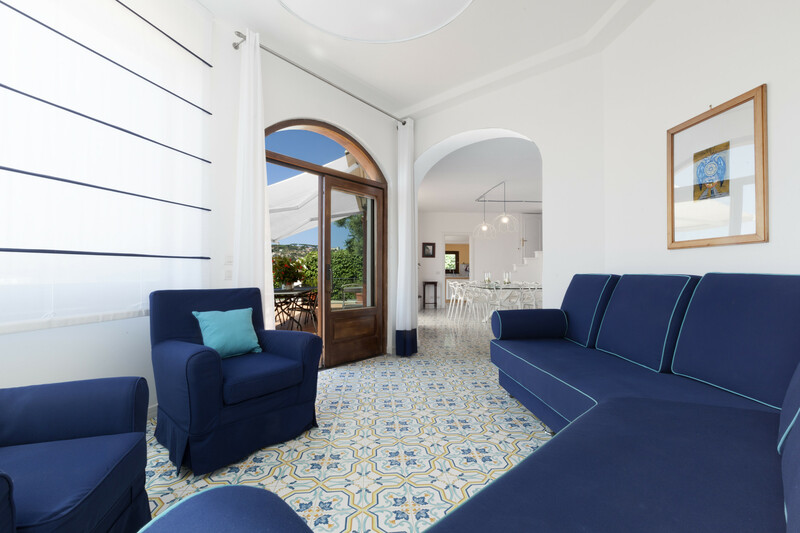 The sitting room is on the same level as the main terrace and is bright and spacious, with large windows and doors onto the terrace, so that even when inside you can enjoy the splendid sea views. 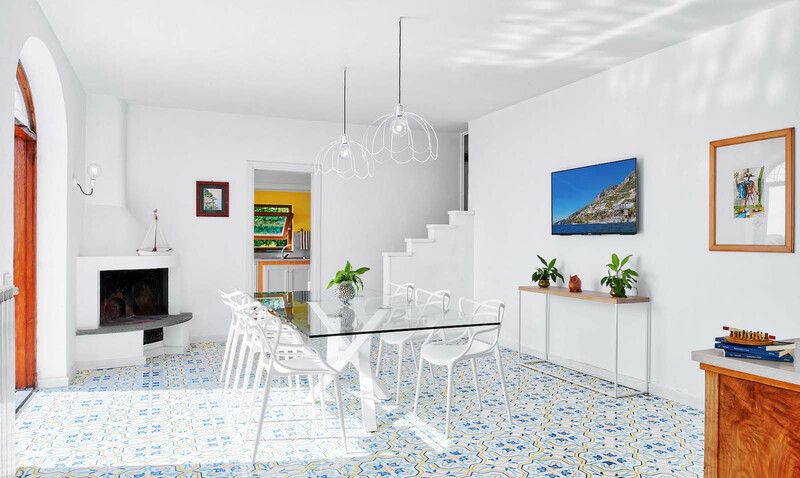 It is tastefully furnished with a patterned tiled floor, sofas and armchairs, a lovely fireplace and a dining table and chairs. 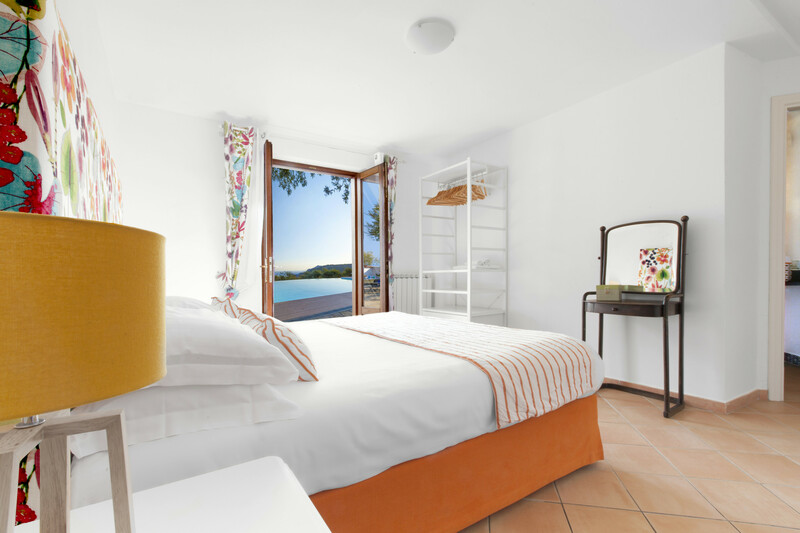 You will also find satellite television, a DVD player, a stereo and an internet Wifi connection. 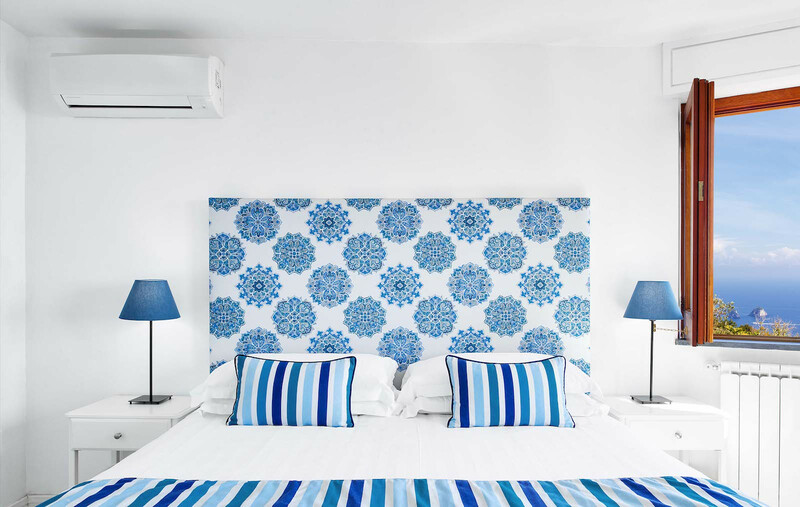 There is air conditioning throughout Villa Chez Piè, plus central heating for chillier days. Heating is chargeable at 4.50 euro per m3. The sitting room leads onto the traditional masonry kitchen. 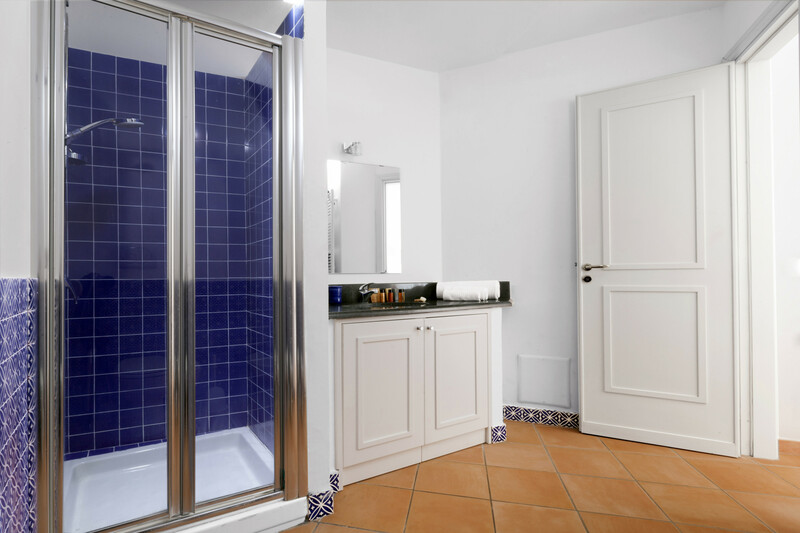 Attractive blue tiles contrast with the beautiful natural wood cupboard doors. You will find everything you need to self-cater during your stay, including a five ring gas hob, oven, fridge freezer, dishwasher, microwave, kettle, toaster and coffee maker. There is also a washing machine, ironing board and iron. The kitchen leads straight through a French door onto the terrace, where you can admire the little garden in front of the house through a window. 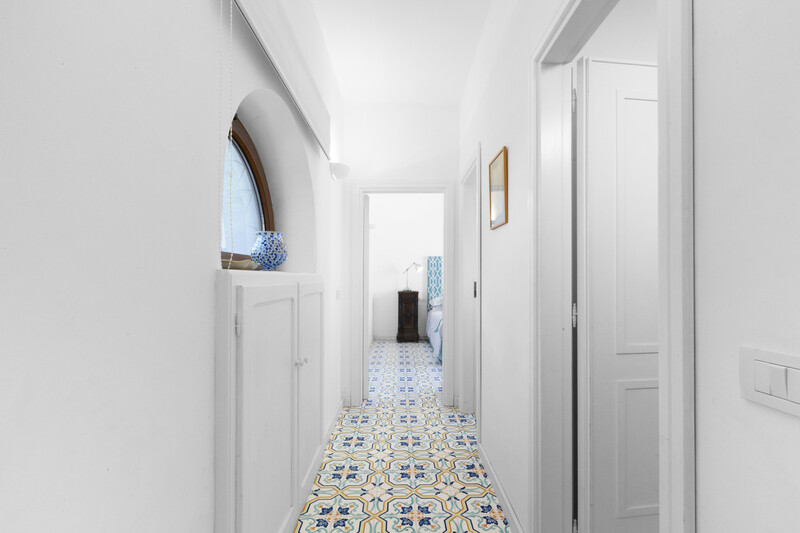 Also on the same level, a short corridor takes you from the sitting room to a sleeping area. Here you will find one bedrooms and a bathroom. 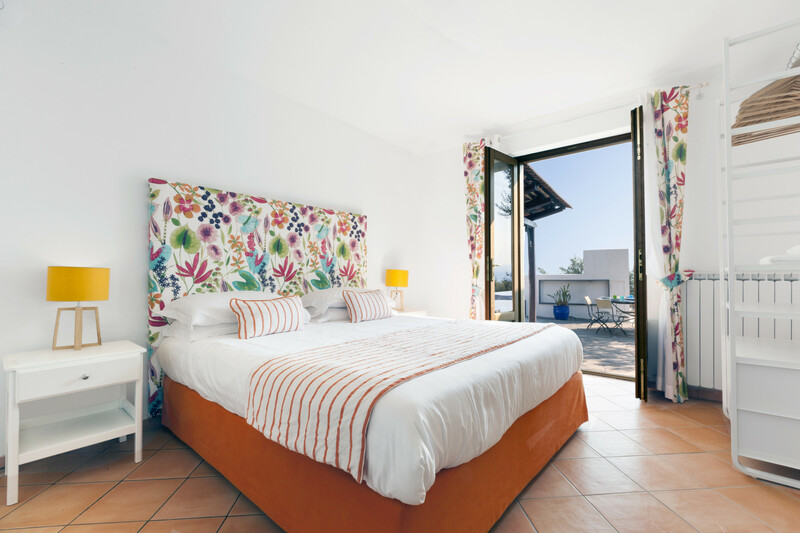 The first bedroom has a double bed, television, and a large window looking out onto the main terrace. 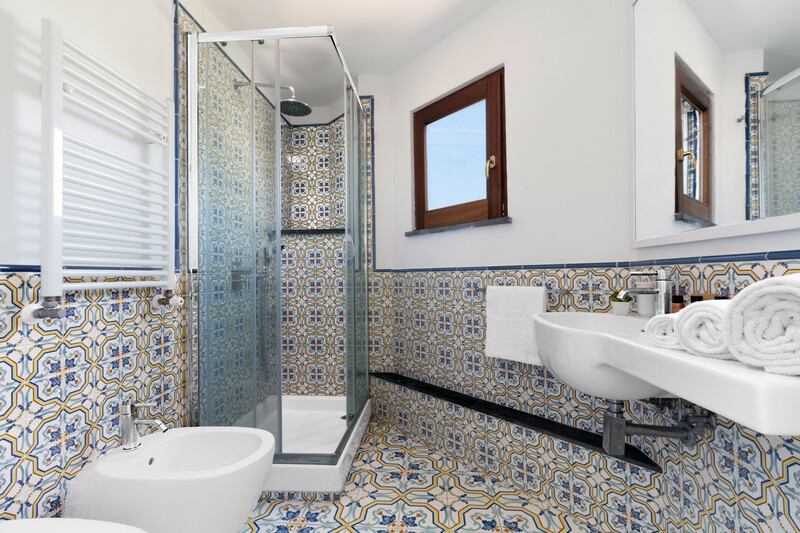 The modern and well designed bathroom has an enclosed rainfall shower, wash basin, toilet, bidet and hairdryer. A staircase with around fifteen steps takes you up to the first floor, where you will find two further bedrooms and a second bathroom. One of these bedrooms is furnished with two single beds, a built in wardrobe, a desk and a chest of drawers. 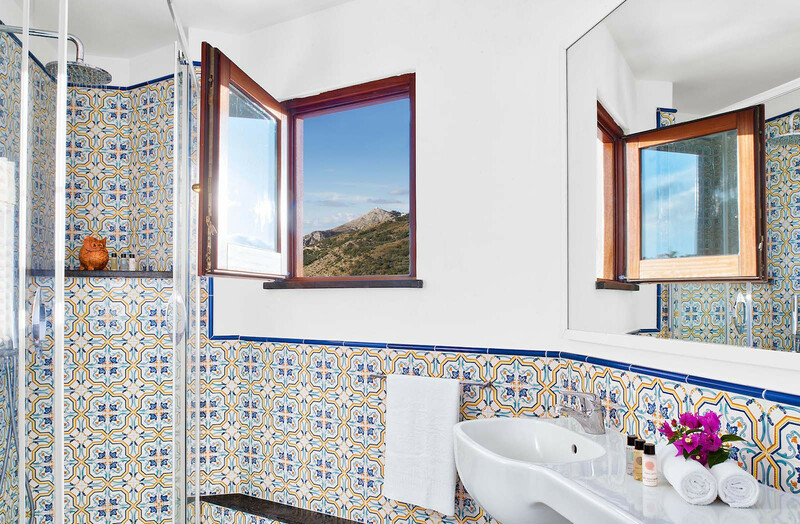 It has a large window with views across the beautiful landscape, just reaching the sea. 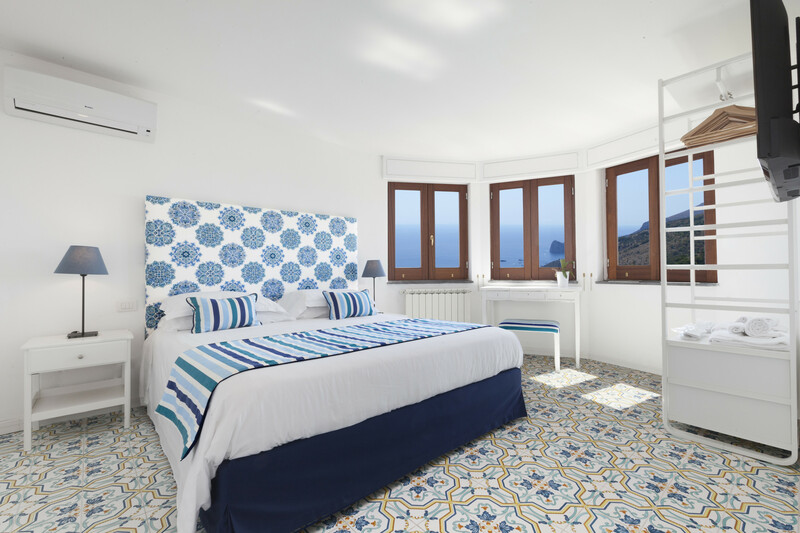 The second bedroom has a double bed and offers spectacular sea views through three large windows. The attractive bathroom on this level offers a shower cubicle with rainfall head, wash basin, toilet, bidet and hairdryer. 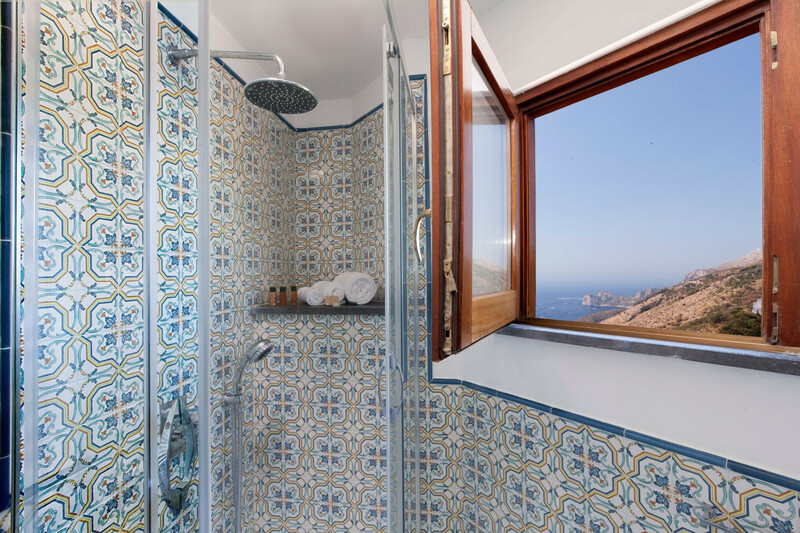 The view from the bathroom window is simply enchanting. 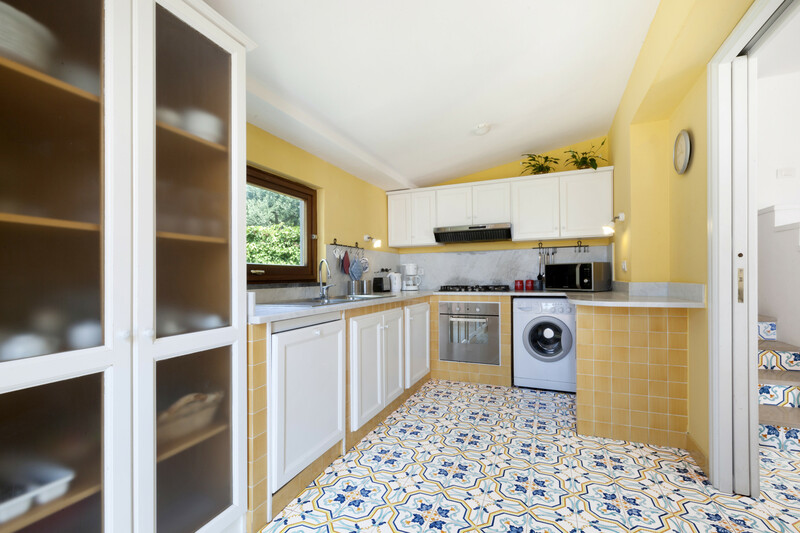 Moving down to the lower floor, on the same level as the swimming pool and barbeque area, you will find a further kitchen, equipped with a gas hob, oven, fridge freezer, dishwasher and coffee maker. There is a small room with a second washing machine. The second living room has two sofas, one of which converts into a comfortable double bed, plus wooden armchairs. The apple green feature archway provides a lovely focal point to the room. 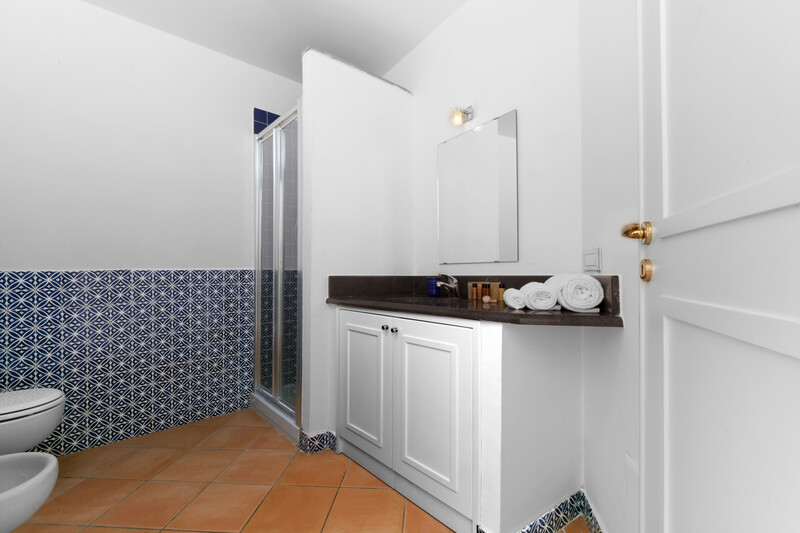 Also on the lower floor are a further double bedroom and the third bathroom, stylishly decorated, with a rainfall shower cubicle, wash basin, toilet, bidet and hairdryer. Should you be able to tear yourself away from the comforts of Villa Chez Piè, there is plenty to explore in the local area. The town of Sant'Agata sui Due Golfi is just 1km away, and offers family-run restaurants, gelaterias, fresh pasta shops, fruit and vegetable stores, mini-markets, bakeries, butchers and fishmongers, coffee bars and pubs. There are many walking trails to appreciate the beauty of the natural environment, ranging from gentle walks to more strenuous hikes. 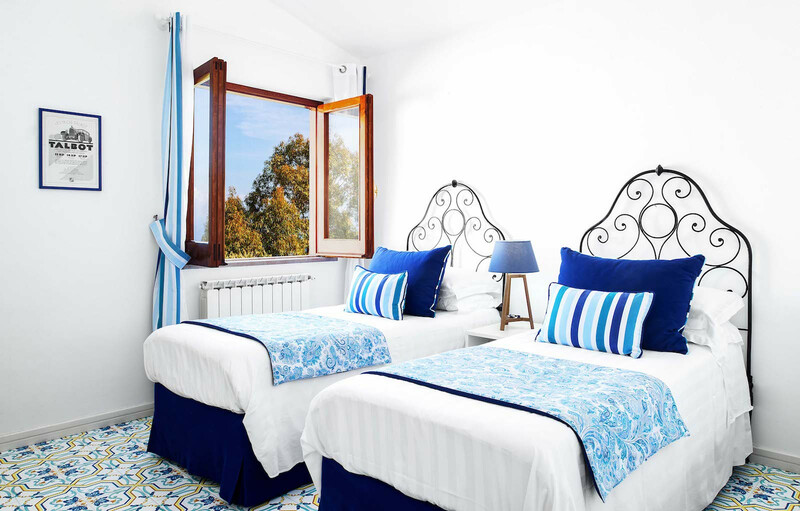 Or you could take the opportunity to explore the Amalfi Coast, with lush Amalfi, Positano and Ravello offering both beauty and cultural interest. 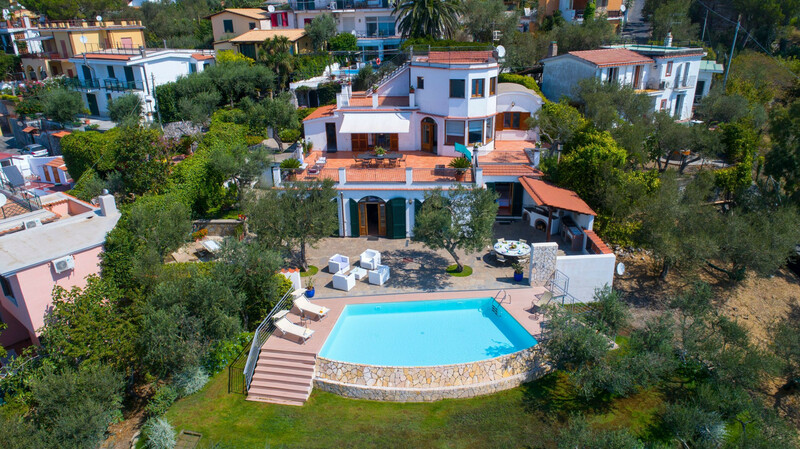 However you choose to enjoy your time at Villa Chez Piè, you are sure to return home with fond memories of this beautiful villa. 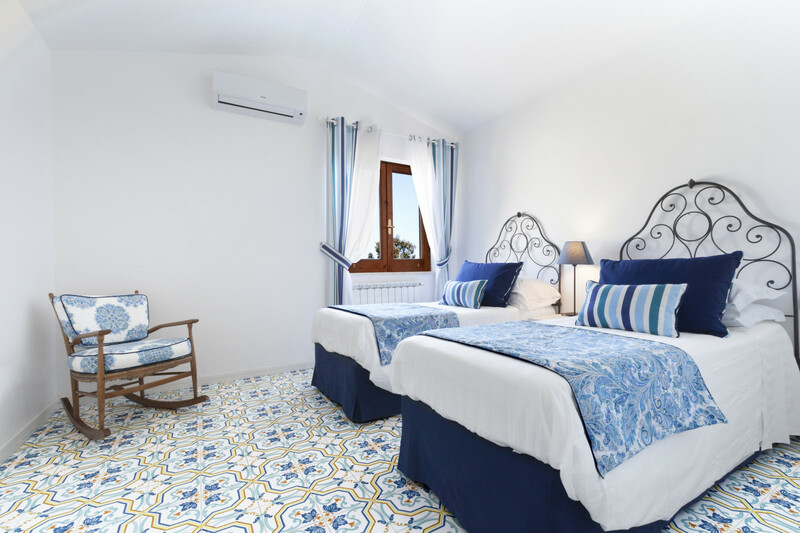 During your stay, you will have daily cleanings at the Villa, 5 days per week. 1 King size bed, 3 Queen size beds, 2 Single beds, 1 Sofa bed double. TV Satellite (Languages: Spanish, English, German, French), Stereo, DVD, garden, garden furniture, fenced garden, terrace, barbecue, fireplace, iron, internet (Wi-Fi), hair dryer, balcony, 250 m² property, 200 m² plot, single boiler on gas, air conditioning throughout the house, private swimming pool (dimensions 10 mt x 6 mt, max depth 3.9 ft, min depth 3.9 ft, opening date 1/3, closing date 30/11), Open-air parking (3 places) in the same building, 3 electric anti-mosquito devices. 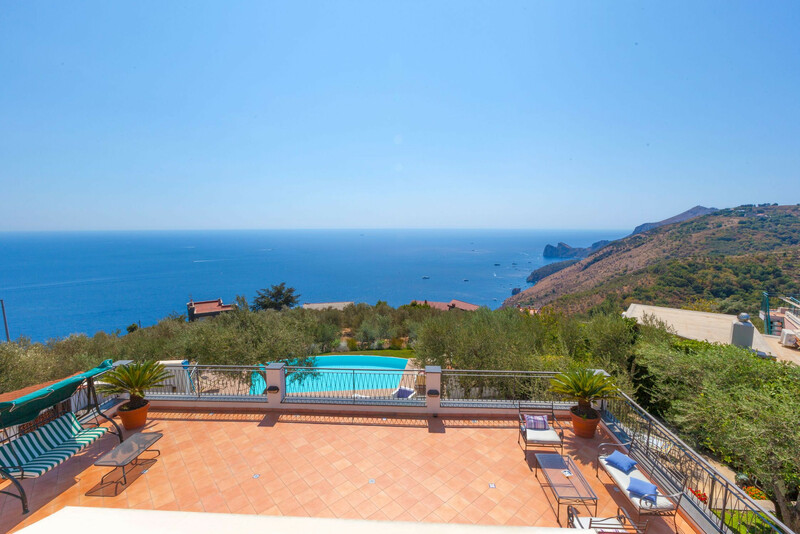 Villa in a beautiful serene setting with views from the hill onto Amalfi Coast. 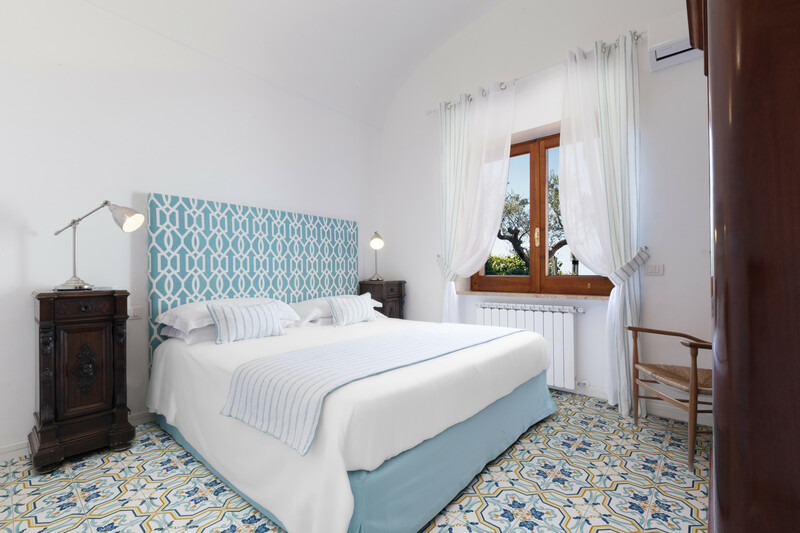 We would recommend this place to anyone wishing to experience the beautiful Amalfi Coast area! 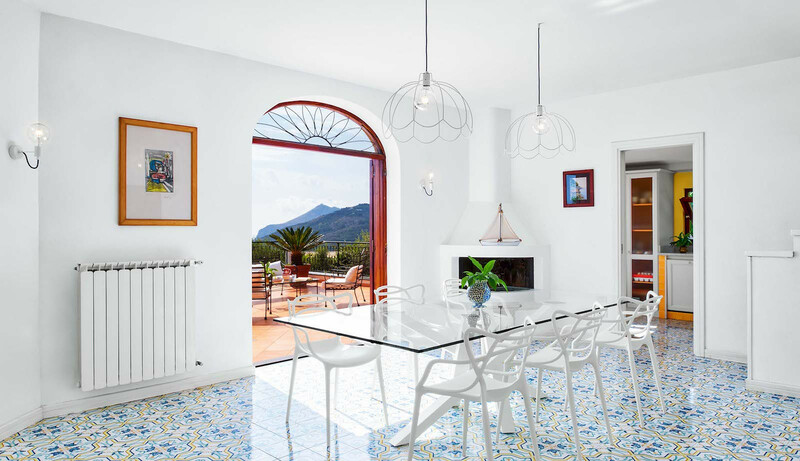 We cannot say enough positive things about this property and Feeling Italy as a hospitality company. Our family of 7 was treated like royalty from the moment we arrived. 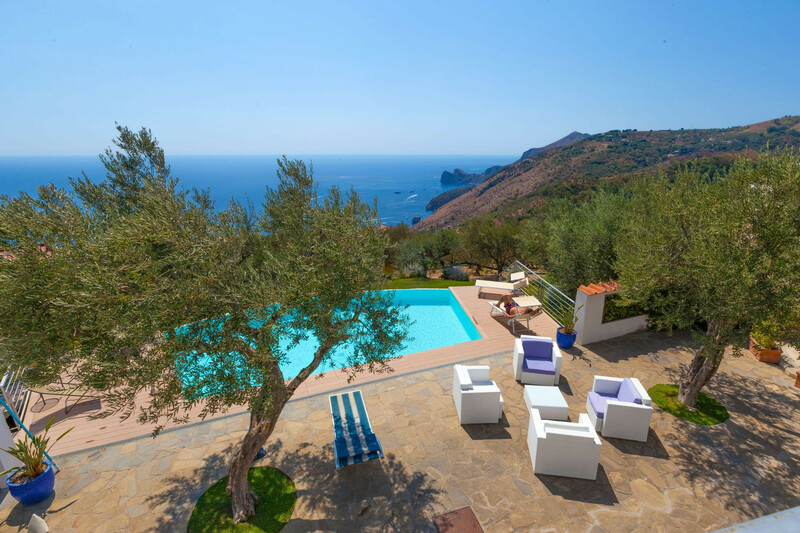 The highlights of our stay were the amazing pool and views, hiring the pizza party, cooking veggies picked from the garden below the house, and the grocery delivery provided by Feeling Italy. 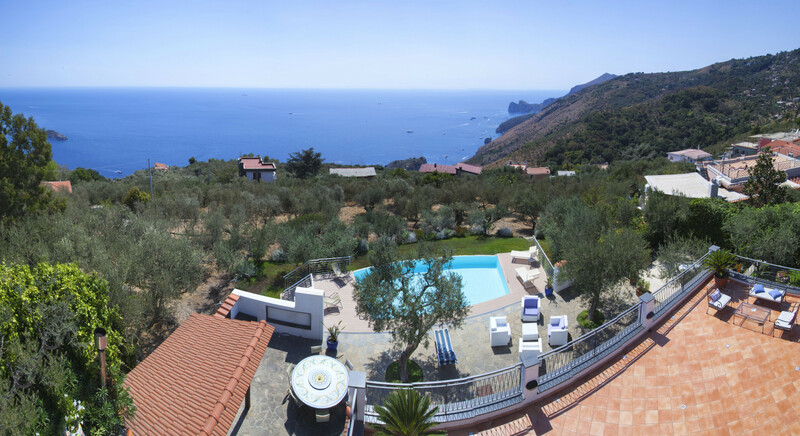 We would recommend this place to anyone wishing to experience the beautiful Amalfi Coast area!